Is Auto Profit Replicator System a Scam? In this Auto Profit Replicator System review, I’ll provide you with enough information to help you make an informed decision on binary options trading. So is Auto Profit Replicator System a scam? Let’s find out. 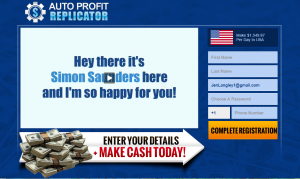 In the pitch video, Simon gives a sales pitch about using Auto Profit Replicator to make binary trades. He claims that once funded, the system will go on autopilot in order to make me an epic ton of cash. I like epic tons of cash, so I figured why not? What did I have to lose? Besides that, he says that the system is free and despite my lack of knowledge on binary trading options, it seems simple enough. I like making money online, so I put my information in the system. If you have been thinking about taking part in the binary options trading market, then you might be wondering where to start. As Simon said in his introductory video, if I wanted to be part of the 375 spots he had available, then I needed to get my myself in gear and put my name and contact information into the website. (see Fiverr: www.fiverr.com/yoogle/do-a-30-second-testimonial-video-in-uk-accent), and tried to go on with learning about how I can earn money with very little effort. The next video congratulated me for nabbing one of their few available spots and reminded me that it takes money to make money. The next steps needed were for me to fund my broker account, activate their hand Auto Profit Replicator software and lastly relax and watch my profit grow. Seems easy enough, right? Yay, let’s get started! On the next screen, I see a Binary Book page embedded and learn that I have an account already created from where I entered my info. Being the curious person that I am, I had to read up on Binary Book’s website just to see what they were all about. So, even though I have yet to spend any of my hard-earned money, if I do, Simon is going to get a nice cut of the action. Simon says that his system will only work with these guys, so when I make my first deposit of $250, he already earns money from me. What this means is that when I put in my $250, he gets $75 off the top. It’s no wonder why he offers his system for free, he’s getting a cut from the back end for doing nothing but sending my business to Binary Book. Shady, shady! Here is where this all gets interesting… Instead of using specific tools and training for the Auto Profit Replicator to work, all I see is information embedded from Binary Book’s website. In order to see the same information, check out: www.binarybook.com/trading-camp and see for yourself. Are there any real tools that Simon offers to help people? At this point, he’s created a website, fake testimonials and is using an affiliate account in order to make money from unsuspecting people. Unfortunately, this area is severely lacking. There aren’t really any pros to using this so-called software in order to make money using binary trading. The only plus I can give this Simon guy is having the knowledge necessary to create a website, landing page, video content and his use of someone else’s affiliate program to make himself some money. In order to go forward with this “free” system, you need to deposit money into one of the only broker accounts this product is said to work with. For me, that was Binary Book. Unfortunately, even if I decide to use them for binary trading options in the future, they have a cookie stored on my system so that this Internet Shark gets credit for any future earnings I make. I didn’t trust the system enough to give them $250 for a deposit, but I have read many comments from those who have – and lost. Unfortunately, the Auto Replicator system is powered by a trading bot that makes random trades for you. Sometimes you win, but most of the time, you lose. From what I could gather, the robot doesn’t have a rhyme or reason for any of the trades it makes and your funds eventually dwindle to nothing. In order to get signups, they don’t claim that the science behind this software is foolproof, lending to its realism for use. In the video pitch, they claim that I might be lucky enough to be one of the 375 people accepted, but their banner claims that they’ve paid out over $380,000. It seems that they are trying to use the air of exclusivity in order to create a club of people who only join because they might get in. Don’t fall for the hype! If I could give any program negative marks, it would be Auto Profit Replicator. Without any real training program on the software’s use and information on how the robot makes its trades, anyone who wants to use the program is left out in the cold. I’ve read many reviews on this product and have found that those who have spent money, lost out and were directed to a poor customer service team. They received little to no response and were directed toward brokers who rarely returned calls. When calls were returned, the staff of the brokerage company was said to be rude and only focused on getting you to deposit money instead of helping you make money. Hopefully, you’ll read this Auto Profit Replicator review before depositing any of your money into this system. It reeks of a scam from the word “go.” Any type of trading options are bound to win and lose you money, but with a robot that makes random choices, you’re better off flipping a coin or just throwing your money away. Your odds are better at your local casino and I’d highly recommend steering clear of this program at all costs. There are many reviews of this product that are clearly sales pitches for the product, but Work Online Scam Free cares about you and what’s in your wallet. Hopefully, it’s money – and we want to help you keep the Internet Sharks from taking it. 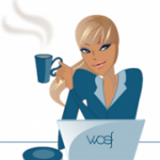 See The Top 10 Ways to Make Money Online.